Hamburg Public Transport, your own android appwith various public transport network maps of Hamburg City. 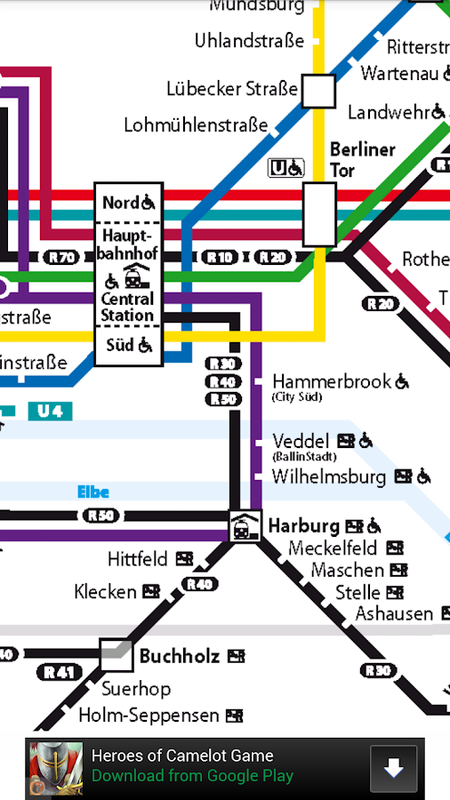 An Appthat makes your travel easier by providing Metro Bus line map,U-Bahn (Metro / Subway / Underground), S-Bahn (Train) and RegionalTrain network map and Harbour Ferries (Boat) maps of Hamburg. 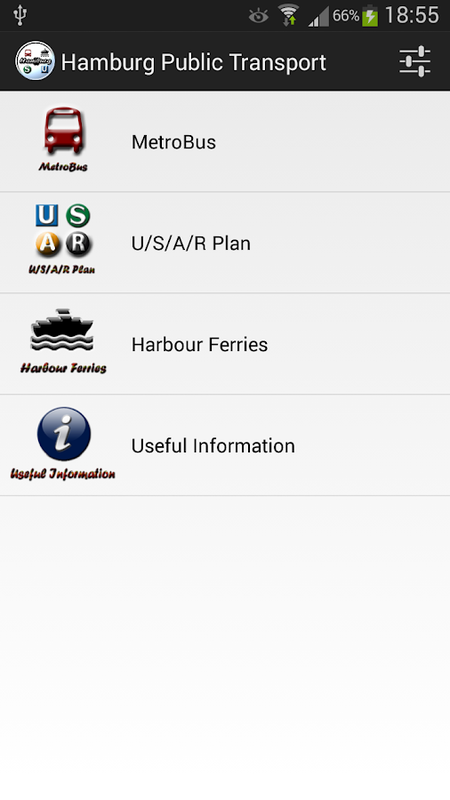 Youcan plan your further journey easier as you have all connectionmaps in your pocket. 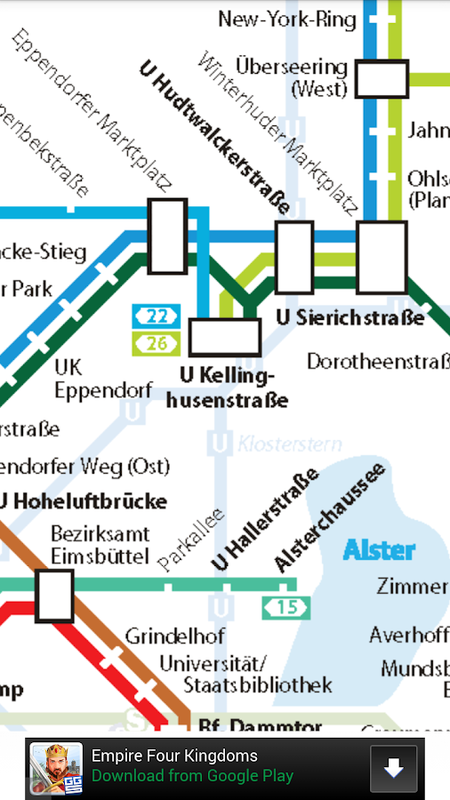 - Public Transportation Maps: This guide features various zoomableimages of public transport maps. - Useful Information: About the day tickets, where to get thosetickets, fares, etc. Please Rate the App if you like it to get it known to otherinterested people, Thanks! The smart way to travel with the HVV App: tickets and timetableswherever you are. Get a bird’s-eye view with the location overviewincluding switchh Do you want to find the nearest station? Find aStadtRad hire bike nearby on the spur of the moment? Switchh to thenearest car sharing vehicle? No problem with the HVV App! Thelocation overview will show you where they are. That way you caneasily see what HVV transport leaves when and where and where tofind the next offer from our switchh partners. Find your personalconnection If the location feature (GPS) is activated, the Appautomatically takes your present location as start point ordestination. Of course, you can also enter stations, stops,addresses or particular places manually. Purchase tickets and savemoney Benefit now from the 3% discount on single, day andsupplementary tickets (this does not apply to weekly tickets andthe Hamburg CARD). Also available: a departure monitor, zoomablenetwork overviews, delay warning function and much, much more ….Tips: • Access authorization „Kontaktdaten lesen“/“read contactdata“: optionally, you can use the addresses of your contactpersons as start point or destination for timetable information.When you have activated this function and selected a contact, onlythis address will be transferred to the background system. You canauthorize the HVV App to access your address book for this. • Touse the timetable information and the departure monitor as well asfor purchasing a ticket via the App, you will need an active onlineconnection, since it is always real-time data which are loaded. Nofurther active online connection is needed once the downloading ofthe ticket is competed. • No guarantee can however be given for theaccuracy or completeness of any information given. Hamburg Metro gives you the knowhow you need to get from A to B. NoMatter whether you are commuting or visiting the city the smartestroute is taking Hamburg Metro along for the ride. You choose thejourney, we'll provide the route. ● Select a route type, which isright for you, either the fastest or which has the fewest changes.● Calculate your route. Know how long your journey will take andhow many stations you will pass through. ● Easy to search for asubway station or find the nearest to where you are now. ● A clearmap with pan and zoom enabling you to view easily while on themove. ● It's FREE so does include adverts. To go 'ad free' there'san in-app purchase available. If you’re thinking of visiting Munichor Berlin, make sure you check out our Munich Metro MVG Map &Route and Berlin Subway BVG Map & Route apps on Google Play:Join us on Facebook at www.facebook.com/MapwayApps or follow us onTwitter @MapwayApps. Let's stay in touch.